Yet again.. Another cowboy roams the streets once more! The team at The Original Roofing Company received a call recently from an elderly lady in her 80’s. She had no husband. No family left. And no one unfortunately to advise her on the roofing cowboys that were moving ever closer to the local area. Knock, knock, knock! Our elderly client answered the door to some so called “professional roofers” telling her that she needed a new roof. She agreed, due to the fact she was experiencing problems with water ingress lately. They proceeded to demand a large sum of money upfront (I still can’t believe some people take advantage of old and vulnerable people like this, it really does infuriate me)! Anyhow, they started taking most of the roof tiles off, apart from the final top 3 courses of tiles and the ridge. Let me add the never even ripped out the battens or felt of the old roof but instead, fitted some tarpaulins to cover the open areas of the roof and tuck them under the tiles they left up there. 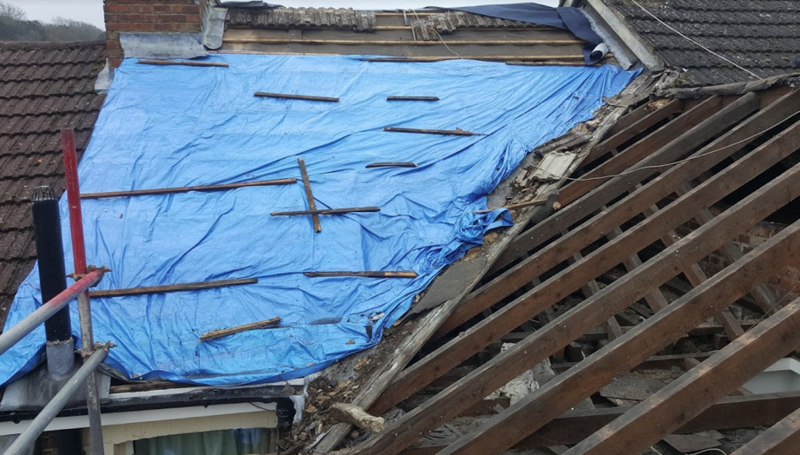 After completing this appalling work they stated “all your rafters need replacing as well because they are rotten”. This was not true and they (AGAIN), managed to take another large sum of money from her. The only reason why she realised something was wrong was because the bank asked her why she was coming to the bank so often to withdraw large sums of money. This then led her to contacting us and after listening to her story and taking a quick glance at what had happened, we instantly got trading standards involved (I have to say they were very helpful). However, the cowboys didn’t stop there. They proceeded to constantly ring our client, pestering and hounding her pretending to be trading standards saying “they will take the money for the job and pass it over to your new roofing company” – of course. I can’t quite believe quite how cunning and nasty some people, especially when it involves an elderly and vulnerable lady who didn’t know any better. This yet again proves that people really do need to be careful nowadays and do their research! That’s why we have created the blog and post to share, help and hopefully prevent others from making similar mistakes with roofing projects.